“Did I tamper with the results? It’s possible.” Uttered by anyone else, this would be a damaging admission. 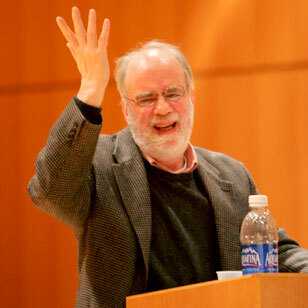 Saul Kripke resigned yesterday from his position as Distinguished Professor of Philosophy at the CUNY Graduate Center. While similar allegations have been circulating in unpublished form for years, a team of philosophers from Oxford University has just released a damning report claiming that they were systematically unable to reproduce the results of thought experiments reported by Kripke in his groundbreaking Naming and Necessity. The team, led by Timothy Williamson, first became suspicious of Naming and Necessity after preliminary results raised questions about related work by Hilary Putnam. While the group was initially unable to confirm that water is H2O on Twin Earth, the results turned out to be due to contaminated research materials—one of the researchers’ minds had been contaminated by Chomskyan internalist semantics. The inability to replicate Kripke’s results could not be similarly explained away, however, as the researcher in question was excluded from the analysis of Naming and Necessity. The report, forthcoming in Philosophical Studies, claims that 74% of the book’s thought-experimental results could not be reproduced using the standard philosophical criteria for inter-researcher agreement. A second version of the analysis, employing a generous application of the principle of charity, still left 52% of the results unverified. Asked whether his team will now turn their sights on other philosophers, Williamson hints that they might adopt a more historical orientation. “Our—ahem—philosophical troubles aren’t limited to thought experiments,” Williamson says with a wry smile. “Take Kant’s three formulations of the categorical imperative. While Kant claims that they’re equivalent, that’s clearly not the case.” This kind of inconsistency, Williamson claims, “constitutes a red flag.” At this point, an argument broke out between this reporter and Williamson as to whether inconsistency constitutes a red flag or whether being a red flag supervenes on inconsistency without being constituted by it, and it was clear that the interview was over. I thought the APA dissolution piece was serious, if Onion-y. The FDS piece had me going. It wasn’t until I hit this piece that I got it. I literally spit my martini all over the keyboard. (I’m billing you for that, BTW). Awesome; thanks for your support and encouragement! I really appreciate it! Reed was actually my first choice for a while, and I might have gone there if it hadn’t been so close to home and more expensive. That’s one of the funniest picture captions I have ever read. I. love. this. blog. seriously some of the funniest stuff i’ve read in a long time. keep it up! Kripke is illuminating to the core. LOL… Hits “experimental philosophy” where it should! Where is the flattr button? I had no idea what Flattr was until you said that. I don’t know if I’ll be adding that to the site, but of course I am flattered! That remains to be seen sir. I hit this page from Twitter, this being my first time here. Oh my! Where have you been all my life? I swear, I was rolling on the floor. I’m off to read the other posts. Is this a thought experiment about a thought experiment? That is an nugget of linguistic insight and joke all by itself, to the effect that what Kripke says is meant by “it is possible…” is so at odds with what it would mean in testimony wrt tampering with evidence! Gravy train riders having a laugh at the taxpayer’s expense. I just lost it. This is the funniest thing I have ever read. Although your text is very well done I voted for “On Eating Animals” because it treats an important question! It took me a while to get it (came here from Twitter, didn’t look at the URL). Brilliant! I don’t know enough philosophy to get this. Anyone want to break it down line by line?! Did Stephen Colbert get a Philosophy Ph.D.? A hilarious challenge to those who treat conceptual analysis and introspection as more reliable than scientific methods. Still, I admit “Rigid Designator” has ominous connotations. So maybe he’s right. 😉 Thanks! I am just amazed to get alerted at increasing damning insistence by some philosophers on experimental results and methods. The tendency needs to be shelved by an insistence on first person thoughts more and more. You guys should be careful with your humor. The problem is that the 75% of people who think that grown men writing philosophical gobbledygook is an inane farse may not be able to tell when such types are joking. My God. I can’t believe it. He used to smile and say hello to me in the corridor. He was just always a nice, regular person. It’s such a trust betrayed. I’ll never be able to look at a thought experiment the same way again. I’m a _computer programmer_, and I guffawed when my friend told me in a phone call that a thought experiment couldn’t be replicated. Genius! Yes, but no. Kripke is such a brilliant mathematician, but such a poor metaphysician and linguist…. If you have ever read “Naming and Necessity”, the primary contention reduces to “The name ‘Joe Smith’ is a rigid designator”… which is obviously ridiculous nonsense, since there are too many “Joe Smith”s to actually consider. Sloppy, pseudo-erudite work he probably did overnight, so he could give a famous lecture based on his “Semantical Considerations”, etc…. Not to forget to critique that “Semantical” is clearly a redundant and otiose word, when “Semantic” would have been quite adequate, instead. “Kwiffee’s” reputation as World’s leading Philosopher has been in debate ever since the 1600’s when J.S. Bach opined that I am a superior Philosopher. I spent most of my career at Princeton trying to overcome their obvious resentment of my enormously (and well-documented superiority) at cognition, and Saul Kripke, actually was one of my strongest advocates and supporters, much to the dismay of the trashy faculty at PU (“look what I almost stepped in”). The main thing that I learned, as a Princeton Philosophy major, who audited Kripke’s “Advanced Logic” class, and took 12 other Philosophy courses, is that Liberal Professors are idiots who are mostly illiterate and can’t do simple arithmetic. So many of them were just lying, cheating, subhuman bastards. Kripke was an exception. editing? “enormously (and well-documented) superiority” would be preferable.., clearly the minions conspire ‘gainst me. Outrageous! As a pure mathematician I’m profoundly ashamed of this unethical behaviour! it generally from the U.S. and You.K. before this four weeks. I get it: check before you publish. It is that simple. Or go back to the rudiments of ethical professional standards. Even conceptualists should subject themselves to some ethics review.